This modern vessel is built in traditional style and is one of four owned by Tint Tint Myanmar that sail on the Irrawaddy in Myanmar (Burma). 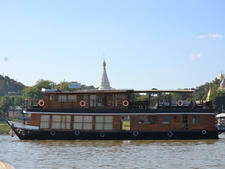 A crew of 13 look after 14 passengers on this boutique river ship. The RV Princess Royal has six wood-paneled standard twin-bedded cabins on the Main Deck and a deluxe stateroom, with twin beds, on the Sun Deck. The cabins are 110 square feet and 180 square feet, respectively. All cabins are air-conditioned with a separate bathroom and shower, and facilities include a mini-bar and complimentary water. There are rattan chairs on the deck outside each cabin, with comfortable loungers and more chairs on the Sun Deck. Also on the Sun Deck is the enclosed dining area, again furnished in traditional style. A variety of western and Asian dished are served, and the ship's bar is open until midnight. Complimentary tea and coffee are available throughout the day. Other beverages from the bar menu are charged to passengers' accounts. Itineraries feature atmospheric dinners served on the sand bank next to the mooring spot, as well as picnic lunches in local villages. The two-night cruises, on the stretch of the Irrawaddy between Mandalay and Bagan, are ideal for visitors who may be traveling through Burma on a land tour and don't want to commit to a weeklong voyage. The largest of four ships owned by Tint Tint Myanmar, Makara Queen is a four-deck ship that sails on the Irrawaddy River in Myanmar. 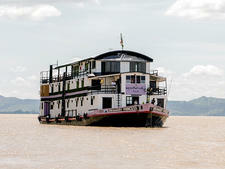 This small wooden vessel, owned by the local Tint Tint Myanmar Group, carries eight passengers and offers short cruises on the Irrawaddy River. 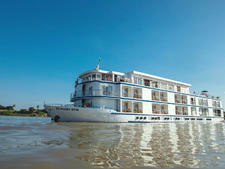 The second largest vessel in the fleet owned by the Tint Tint Myanmar company offers space for passengers who want to explore the Irrawaddy on short itineraries.